William Hill Casino : enter the world of casino, live casino, poker and sport betting ! William Hill was the first company to offer sport betting in Great Britain. In 1934, its founder, Mr Hill, launched underground sports betting because gambling was prohibited at the time. From now on, the operator, which has become the reference for all English players and which is also one of the biggest names in the gaming industry worldwide, acts in complete legality. He owns licenses from several regulators : UK Gambling Commission, MGA in Malta, Gibraltar Gambling Commission, Direccion General de Ordenacion de Juego in Spain and ADM in Italy. William Hill is the land-based bookmaker with the largest number of licensed betting shops in the UK (more than 2,300 of the 8,500 existing) and one of the largest websites for online betting. With over 80 years of experience in the field of sports betting and a wide selection of more than 60,000 football matches to bet on every year, sports betting really is the core business of this operator. However, as a mega brand, William Hill has much more to offer to his players! Casino, Live Casino, Scratchcards, Poker, Bingo, Table Games… these are the many verticals found on William Hill Online, making it one of the most complete online gambling operators for UK players. The experience is just as satisfying on mobile phones thanks to the many William Hill applications they have developed. The operator’s figures are impressive. They have more than 3 million active mobile players worldwide and their business is based on over 16,000 employees in 8 different countries. The mega brand achieved a net income of £1.62b in 2018, an increase of 2% compared to the previous year. Its activity is still focused on the UK, its main market, where it generates 86% of its turnover (56% of its turnover comes from betting shops and 39% from its online activity). Since 2002 the bookmaker has even been listed on the London Stock Exchange, which confirms his weight in the gambling market. In November 2018 WHG (International) Limited carried out a huge commercial transaction by acquiring 92% of the shares of the Swedish operator Mr Green for £245 million. Mr Green is headed by Patrick Jonker, head of William Hill’s Internet division, from the Island of Malta. In our William Hill review we will come back in more detail on the casino part and in particular on the William Hill slots, its table games and its live casino offer. The brand has almost as many welcome offers as verticals and the good news is that players don’t have to choose which offer they want to receive. As long as they comply with the terms and conditions of each promotion and are therefore eligible, they can take advantage of William Hill promotions for each vertical. So you can receive the Casino Sign Up Offer + Live Casino Bonus + Sport Betting Promotion ! In this William Hill Casino review we come back in detail to the different casino bonuses of the operator. William Hill Online Casino offers you the following welcome bonus: receive 100% of your first deposit as a bonus up to a maximum of £300. If you want to enjoy it, go to the Casino tab and click on “Promotions”. Choose the 100% buy-in in Bonus up to £300 offer and indicate the amount of your buy-in which should be between £10 and £300. If you prefer to play without a bonus, simply make a first deposit without going through the “Promotions” box. Games count differently in the wagering requirement (for example : Slots & Scratch Cards : 100%; Baccarat, Blackjack, Craps & Multi Spins Video Slots : 20%). The winnings obtained with your William Hill bonus can only be withdrawn once the wagering requirement has been met. Your funds will then be transferred from your Balance Bonus to your Real Money Balance and you’ll then be able to request a withdrawal. The winnings obtained with this bonus may not exceed £2,000. Once you have received your bonus, you have 7 days to use it and to meet the wagering requirement. Only for new customers to Casino page. All Terms & Conditions here. William Hill Casino also offers a live casino bonus that should appeal to live casino fans as they will be able to receive 100% of their first deposit as a bonus up to a maximum of £100. It should be noted that this William Hill bonus is subject to a very important wagering (x70) which can be complicated to realize. The winnings obtained with this bonus may not exceed £5,000. The wagering requirement can be obtained at Live Roulette tables (except if Chip placement that covers 66% / 25 numbers, or more of the table and others). Other conditions apply; consult the T&Cs on the operator’s website. Once the bonus is issued you have 7 days to use it and complete the wagering requirement. Only for first deposit qualifies. The brand has a very wide range of payment methods. Whichever one you choose, you should be aware that the operator does not charge any fees, either for deposits or withdrawals. The minimum amount that can be deposited is specific to each payment method. If you use a Credit Card, EntroPay, Kalibra/Postepay or if you make a Bank transfer no minimum deposit is required. In addition, all payment methods available on this site allow you to deposit up to £5,000 except Paysafecard which is limited to £200. HOW TO WITHDRAWAL FUNDS AND MINIMUM WITHDRAWAL ON WILLIAM HILL CASINO ? To withdraw your William Hill winnings the process is very simple. Go to the “Withdrawals” tab of your account, enter an amount and choose a payment method. Remember that the operator will not be able to make any payments until you have verified your account. So don’t forget to send your documents to the operator! For deposits and withdrawals the operator also offers to use William Hill CashDirect in UK, a payment method based on a voucher system available in William Hill shops. This solution is for players who want to play with cash or withdraw their winnings in the form of cash. On the other hand, transactions are not done online since you have to go to one of the brand’s points of sale, which is not very practical. The minimum amount you can deposit or withdraw via Cash Direct vouchers is £10, the maximum amount is £5,000. The gambling operator does not charge any fees for deposits and withdrawals. Only fees from your bank or the payment method you have chosen could be charged, but no processing fee is charged by William Hill. Once your account has been verified and the KYC is done, it takes about 24 hours for the operator to verify your withdrawal requests, validate them and start the payment. First you must check your age to prove to the operator that you are of legal age. Only people aged 18 and over are allowed to open an account on its site and play its various games. To do this, simply provide the operator with an identity document (passport, national ID card, driving license or birth certificate). In a second step the casino must ensure your identity to eliminate any risk of fraud, this is the KYC process. To do this you must provide him with a utility bill or a bank statement less than 6 months old or a signed credit agreement. All these documents can be uploaded to the Verification Page, transmitted directly via live chat or sent by email to the operator. Documents received via the Verification Page or Live Chat can be verified immediately, whereas it takes 24 hours if you choose to send the document by email. WHAT IS AN INACTIVE ACCOUNT ? A player’s account is considered inactive when he has not registered any activity (no wagering, betting, placing, depositing, withdrawing or transferring) for 13 consecutive months and has funds in the balance. In this case, the customer is charged an inactivity fee. They are in the order of £3 per month or the equivalent of 5% of your balance. In any case, the operator will notify you in advance that the status of your account is about to change and that fees may apply. To avoid having to pay them, all you have to do is take an action on your account. For example, make a bet or withdraw the credit you have left in balance if you no longer wish to play on this site. 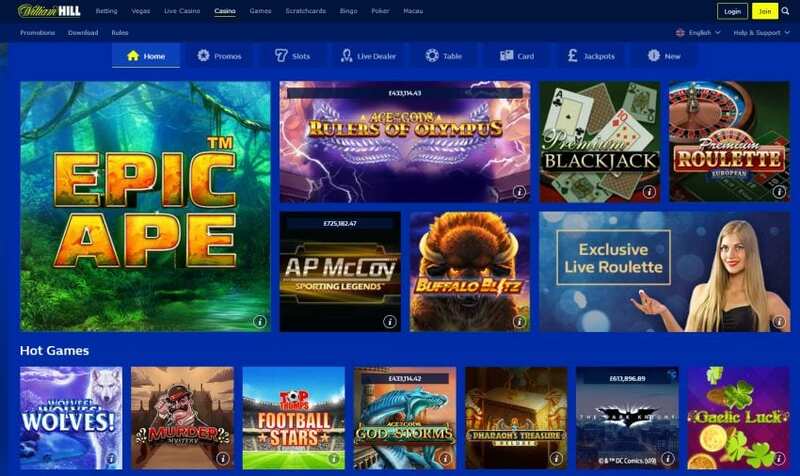 As a mega brand, WilliamHill offers all types of online games: video slots, live casino, roulette, blackjack and other table games, poker, bingo, scratchcards and of course sport betting. 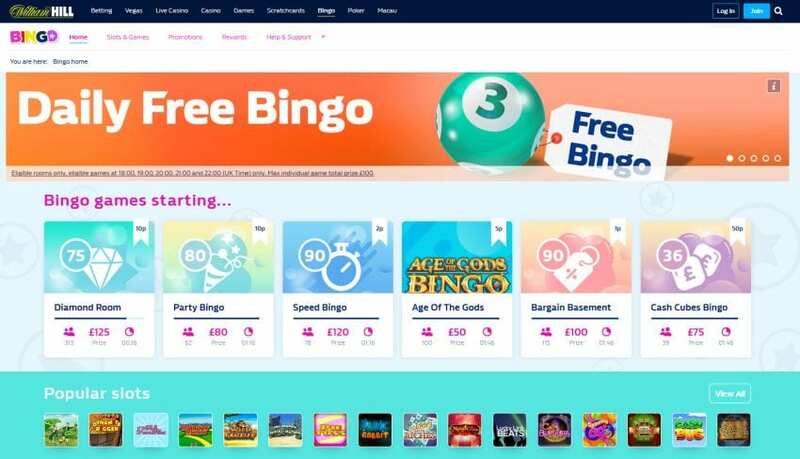 Casino, Games, Live Casino, Bingo and William Hill Vegas verticals use the Trafalgar platform that was developed in-house. For Poker the operator uses the Playtech platform. In total, over 1500 William Hill slots are waiting for you on this mega brand’s website. A very wide choice that will allow you to find your favorite video slots and discover games that you have never had the opportunity to play before. Discover the slots of the biggest providers (Playtech, Microgaming, NetEnt, BigTime Gaming, Thunderkick et SG Gaming). On William Hill casino, we particularly appreciate that, for each slot machine, the player has access to information such as RTP and maximum payout in just one click, which is not the case in all online casinos. You like to play online from your computer or mobile but you want to rediscover the sensations you feel in a land based casino? Why not test William Hill Live Casino? For his live casino the operator has created a subdued atmosphere that reminds us of the casino universe. Here you are not playing against a computer but against real dealers who take turns 24 hours a day behind the cameras. For its live casino William Hill naturally calls on the market’s leading providers, Evolution Gaming and NetEnt. There are many live casino games available: Roulette, Blackjack, Baccarat and Poker. There is also a Dream Catcher game and a Football Studio. The operator even offers several exclusive tables such as WH Blackjack or WH Roulette for example. When you are in the live casino lobby the operator indicates, for each table, the minimum bet amount, the maximum number of players and the number of chairs occupied, which makes the choice of tables much easier. Given the history of this operator, the William Hill Betting part is certainly the most developed. You will find a wide selection of sports to bet on (football, tennis, basketball but also cricket or ice hockey). You can also place bets on horse racing, greyhound races or virtual sports. The betting platform is enhanced with a lot of information used for your bets: results of the last matches, competition calendars, most popular bets and even a daily racing podcast. We also invite you to discover WH Radio which transmits greyhound meetings and the greatest horse racing for free. The lobby for William Hill Bingo is really well designed. At a glance, you can see the number of players participating, the prize and the bets. In total, the UK gaming operator has around thirty scratch games, including several Jackpot Scratchcards, and very often offers new features to vary the pleasures. There is something for everyone since the William Hill Scratch Cards include games with very different themes (horse racing, football, Harley Davidson) and scratch games based on the most popular video slots like Cleopatra or King Kong Cash. Poker players can find William Hill Poker on a computer, tablet or smartphone. Discover a very wide selection of games (Texas Hold’Em, Omaha, Stud…) and choose your tournament type (multi table, SitnGo, cash tables, speed poker). If you are a beginner and want to improve your playing technique, the operator even provides you with a Poker School that can provide you with valuable advice. William Hill apps are available on iOS and Android and that’s a great thing since we know that more and more of you are leaving your computer and preferring to play from your smartphone or tablet. The brand is operated by WHG (International) Limited. The latter is based in Gibraltar. It is logically regulated by the Gibraltar Gambling Commission (RGL no. 034 & 042) and has a licence from the UK Gambling Commission (number 000-039225 R-319373-001) for UK players. WHG (International) Limited now also operates Mr Green, which allows him to benefit from his MGA license. William Hill is registered with the I.B.A.S. This service is responsible for arbitrating disputes that may arise between licensed regulated gaming operators and players in the UK. The operator is also regulated in Italy and, in February 2019, together with 69 other companies, obtains a new online gaming licence from the Italian Gaming Regulator Agenzia delle Dogane e dei Monopoli (ADM) valid until 31 December 2022. This new licence was only granted to operators who already had a licence in Italy and who achieved at least €1.5M in turnover. It was also subject to a royalty payment of €200,000. It also holds a license for the Spanish market from the Direccion General de Ordenacion de Juego. Finally, since 2012, it has been present in some US states, but for the moment the share of the US in the company’s turnover is still minimal (3% of total turnover in 2017). While on some sites you have to choose between receiving a bonus for your sports bets or a bonus for playing at the casino, with William Hill you can enjoy both a casino bonus + a live casino bonus + a sports betting bonus + a poker bonus + a bingo bonus for example! Before choosing an offer, make sure to refer to the T&Co and in particular the wagering requirement. We are dealing with a mega brand, so we find a very large selection of William Hill games: from sports betting to casino games, Bingo or Scratch Cards. The operator does not overload your smartphone with an ultra-heavy application. There is an iOS application and an Android application for each vertical. Download only the ones you need. The brand has the widest range of payment methods including Paypal. The most loyal high roller and players will be able to obtain VIP status. The William Hill VIP program includes a dedicated VIP Manager, access to Roulette and Blackjack tables reserved for high rollers and exclusive bonuses. It is simply unfortunate that a player cannot assess whether he has soon reached VIP level or not, indeed the entry into this select club is only by invitation from the casino team. WHAT WE WOULD LOVE TO GET ON WILLIAM HILL ONLINE CASINO ? At a time when some online casinos pay within 2 hours, we would like William Hill winnings to be paid faster. Today the payment speed is only 24 hours.